While this is being worked on, I encourage anyone who hasn't done so yet to play Oriental Blue: Ao no Tengai. It's excellent fan translation (translated by Tom) of a very good GBA game. Amazing visuals, rately used historic pseudo-Asian fantasy setting, unique atmosphere and a degree of freedom only present in few other JRPG titles (like the Romancing SaGa games). Plus, in terms of content it's probably one of the biggest 16-bit RPGs ever. Battles aside, it's not very much like other Tengai Makyou titles (it's more on the serious side), but I think every fan of classic JRPGs and Japanese aesthetics will love this game. Thanks for promoting Oriental Blue. I worked hard to translate that one, and Kingcom worked hard to hack it. It's also the only game in the series that has crafting and customization that play into battles. (Most of them follow the standard formula... Level up, get stronger.) Oriental Blue bucks the trend. Pairing this with its relative non-linearity... It really is a unique entry in the series, in every way. When I first played Oriental Blue, I didn't really like it... But it grew on me the more I played it. I enjoyed the poems and the way it very carefully alludes to the story in the prequel that was planned, but never released. 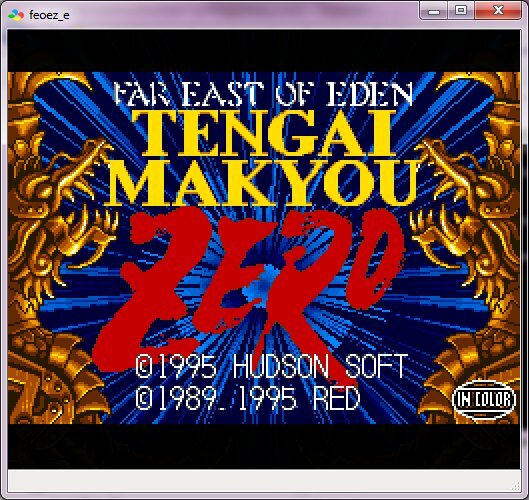 Tengai Makyou Zero is, in many ways, much lighter and easier than Oriental Blue: Ao no Tengai, but that being said, TMZero tackles some subjects that are far more serious than anything presented in Oriental Blue. There is one particular moment late in the game that absolutely shocked me... I won't go into details about it here, though. You'll see it for yourself, eventually... If you're thorough. "Few people remain with the skills necessary to do a translation for FEOEZ. I keep hoping someone else will do it and save me the time, but it looks more and more unlikely as time goes on. I am over booked at present, but I will see that this game is translated before I retire. I own a copy of this game too." This post was five years ago. Nightcrawler is an awsome hacker with an outstanding track record. Have a look at his finished projects. Just ask him, maybe he is willing to do it as it seems that work on Heracles 4 is steadily coming to an end. In my eyes he would be the perfect choice. Furthermore Bongo from Dynamic Designs (very active, gets projects done, good quality of hacking) or Lost Templar (impressive work with Arabian Nights!) come to my mind. Nightcrawler is skilled indeed but he's also very busy between RL, his translations and keeping up RHDN. I think his last remaining announced translation is Song (Poem?) of the Angel. Just being honest with you, NC, I guessing that's probably the next couple years of your limited ROM hacking time. I heard good things about Nightcrawler and Bongo, but I didn't want to insist on anything. How could I suddenly impose on them? I couldn't just send them a message saying... "Hi, you're the one for this job. Forget what you're doing, and put this on the fast track." I wanted the project to be open to anyone with these three things: the time, the desire, and the ability to work on it. Even if somebody has the desire and the ability to work on the game, if they don't have the time, it's all for naught. It would just sit unhacked for years again. I don't want that to happen. It's funny that you mentioned Lost Templar, as he is the one who laid the groundwork for this translation. He expanded the rom, dumped and inserted the script, and got the main font in... Without him, this translation wouldn't exist. He's very busy at the moment, though. Again: time, desire, and ability... He has the desire and the ability, but no time. Update: Totally revised, localized scroll names are in the game now. At first, I hesitated to translate them because of the way fusion scrolls work... (Fusion scrolls pair two elemental kanji together, something that doesn't translate well into English.) I solved this by actually blending the English words. For the single use scrolls, there was VERY limited screen space, since they fit in a very small space (due to the fact that all of them originally consisted of two kanji characters). All of the new names are four to five letters. Sometimes even five letters were too long, depending on the size of the letters. I had to really rack my brain (and do a few thesaurus checks) to get the coolest sounding word that could convey what each scroll does, while using the fewest possible letters. I managed to do this with NO abbreviations, and it felt great to finally do. The new names will make it very easy for English speakers to know which spell does what, without having to look at an explanation. They make sense. Plus, they'll make it much easier to hack the scroll menu. Now, it's just a matter of dummying out the redundant Japanese text and getting rid of memory overruns. I'm doing my second run through the game in English now, and I've been adding further polish to the formatting. The game will be very nice and neat. I'm making sure that each window of text holds a complete thought, so you'll never see a line break into a new window just to print a single word, or anything like that. And then there's DQM1&2 revisions still... And a few other releases scattered about that never got released. The coming year should be an exciting one, though. Got Tom's permission to post updates on Tengai Makyou Zero. Started fixing little things, like this clock not counting or displaying right. Prototyping screens out and measuring available space. Expanding item names past 8 tiles will require modifying some menus. Testing a method to upload tiles to memory, and see how the main menu will look like with an 8x8 font. One more screen before I head out of town for the weekend. Added the commands to the Scrolls menu, and cleaned up the garbage tiles that would appear in the blank spaces. Thanks for the summary, Hiei-! You know, I never expected that the project would be moving this quickly. This project could have been finished years ago. Although DougRPG and FlashPV have not posted anything online (as far as I know) aside from Doug's text hack image and video, the graphics hacking is proceeding well. The shop signs mostly use unique graphics for each town, so it's not as simple as changing one inn logo and having every other inn in the game display the proper sign. The way the graphics are done require each instance to be encountered in the game, documented and translated individually. Not hard, of course, but it's more work than it could have been. We've gone with mostly iconic graphics... So weapon shops will have crossed swords... The publishing centers will have a paper and feather pen, the hatchery has an egg... The only exception so far would be the Inn signs. Those are spelled out in English. Reworking the items and almanac entries will be the main hurdles to overcome (for me, at least). For the moment, I've spent my free time working on perfecting the formatting. I keep hoping that as DDStranslation becomes more familiar with the game, maybe he'll be able to work out a new way to organize the menus that will give the items more breathing room, to avoid too much abbreviation... But I think it's just going to be a matter of cracking down and shortening them with as much care as possible, in the end. The multiple-choice menus that appear in the dialogue windows are VERY finicky. I've got them working now, but they're NOT auto-generated. I had to space the text in the script exactly where the highlights were. Took a lot of trial and error. Of course, the in-script references don't need to match up exactly. If, say, the Royal Dragon Longsword was referenced in a choice (it isn't, by the way)... I could theoretically leave the name as that in the dialogue while having the actual item abbreviated (with a sword icon in place of the word longsword, or something to that effect). I'm going to mull this over as I continue my (currently second) playthrough of the English version. Yikes, Royal Dragon Longsword is one heck of an item name. I'm not surprised it's too long... Although I'd rather rearrange a menu to fit in full unabbreviated names, I've had to resort of doing double line item hacks in the past. With 12 characters per row, Royal Dragon Longsword would fit that way. 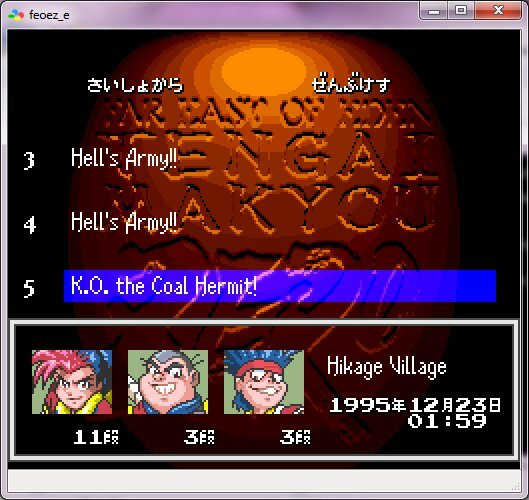 Looking at some of the previous screens, I'm guessing FEoEZ is one of MANY SNES JRPGs to use 1.5 tile high 8x8 item names (possibly using HDMA to visually squeeze out the remaining 0.5 tile). The problem is, the item names (and descriptions) don't just take up one menu... They are used in multiple, different menus that have different limitations. In many menus, double-line translations are simply not feasible because there's already too much information on the screen. There's simply no room for anything more. Restructuring the menus might squeeze out one or two more letters, at best. Which means that the items will have to be shortened. Icons will help a lot, though they haven't been incorporated yet. As much as I can, I will avoid abbreviations... So you won't see anything annoying like RDLngSwrd or anything like that. I would just give the longer items a shorter name with a similar theme, as I did with the scroll names. New background for the save screen. The new font for the title screen. Item names still need to be finalized, so went back to the Almanac screen. No more garbage tiles and dates/numbers/words display correctly. FlashPV, you're doing a great job so far. We still haven't scratched the surface, though! There are still a ton of graphics left to translate! The good news: All items are finalized now. Some of them will use icons as abbreviations when displayed in the small font in menus. (For example, a sword icon instead of the word sword or longsword.) In the item descriptions, the full name of the item will still appear. Very few changes were necessary with the use of icons, but some items were reworded slightly (without changing the overall meaning)... Instead of having Flowery Earrings (which was just a BIT too long), the name of that item is now Floral Earrings, for instance. We'll still have to create the icons, though. I'm sure FlashPV can handle that. Wow Tom, you made it! Yeah, thanks for your prodding, dejan07! FlashPV finished creating all of the item icons for the small font, which means that all of the items should be displaying properly in the menus soon, once DDStranslation incorporates them. I understand Tom's frustration to be honest, there has been projects that have been sat on for years with little to no hope of seeing the light of day from many translators, I think it would help to let active translators to take a whack at it instead of it collecting dust, I think RL, and other things have a tendency to creep up on all of us, and passing the torch should always be a option. Finishing up the Clock screen, centering the text, and showing the mm-dd-yyyy format as requested by Tom. Expanded the Scrolls combat menu a bit, and added all labels and fixed garbage tiles from appearing now. Testing out a method to upload item names, still need to fix tilemap. Moved some stuff around on Inventory screen to make room. 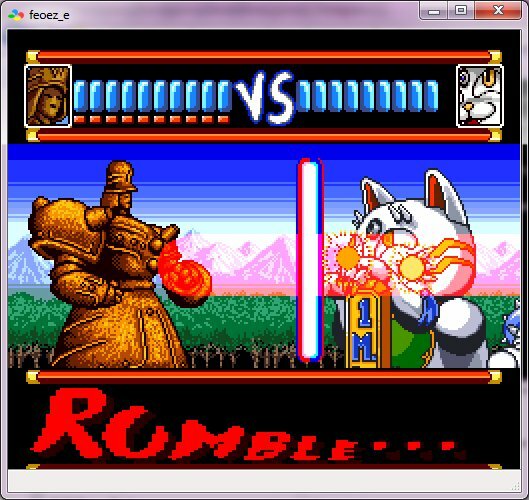 The cat battle graphics translated (edition by FlashPV). The "VS.", shield and Rumble graphics.